When it comes to choosing your wedding flowers, you will want to first consider and be realistic about the time of year you will be getting married. 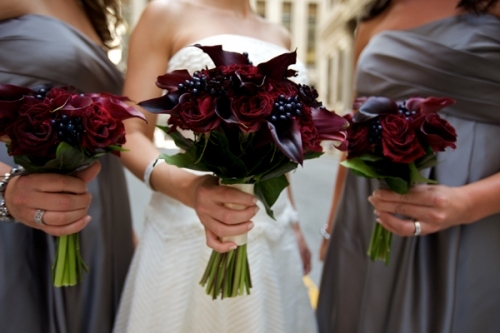 If you are set on having a certain flower, make sure it will also correspond to your wedding season. After you have the season nailed, it's time to discover what is available to you for that time of year in the area that you will be having your wedding ceremony and reception. If you're having it local, call or visit your local florist for a hands on and a visual approach. 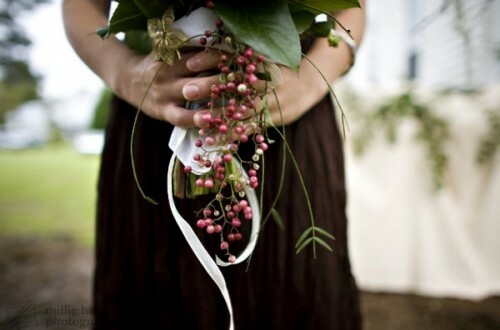 If you are meeting with a florist, you will want to have some idea of what you want. Make an organized list of your questions and ideas. 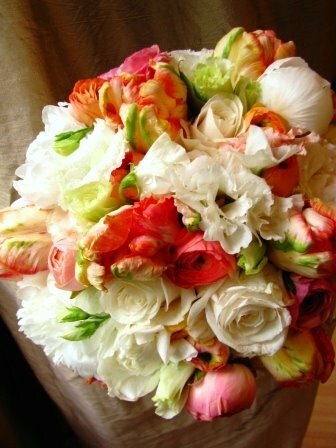 If you have a wedding date, check out Brides.com Flower Finder to see what's good for your season. After that find particular flowers you are interested in using, look through wedding and gardening magazines to find photos to help you describe the things you like about the flowers or flower arrangements of other bouquets. Think of it like you are going in for a hair cut with a certain style, you wouldn't want to just describe the cut, you bring a picture. This will make communication easier. One of the biggest things to consider, in regards to cost is deciding on who and what is getting flowers. Are you suiting out the entire bridal party? This includes ourself, your soon-to-be spouse, groomsmen, bridesmaids, mothers, fathers, grandmothers, grandfathers, flower girls (hair garland or petals), ring bearer and even ushers and readers are distinguished with a corsage or boutonniere. Seems like a large and overwhelming list right? That's just the people. Are you decorating an entire chapel and reception hall? You can decide what you want. Remember that. Traditionally, that's the list, but bear in mind that many people are learning to break tradition and do what they want or what works more for their budget. Personally, I would call a few different florists and see if you can set an actual sit-down appointment. If they tell you to just stop in whenever, ask when they are least busy so that you can get full attention. Gather notes on what they have available, bring your photo diary with notes about each clipping, ask if the florist has wedding package deals (hopefully a take-home printout) and if you're wanting organic flowers, find out your cost differences. Make sure you also talk about the types of flowers you present. They may be able to provide you with any type of flower by special order which can get more expensive, so make sure you know what they can provide locally, in season and what they would have to special order. 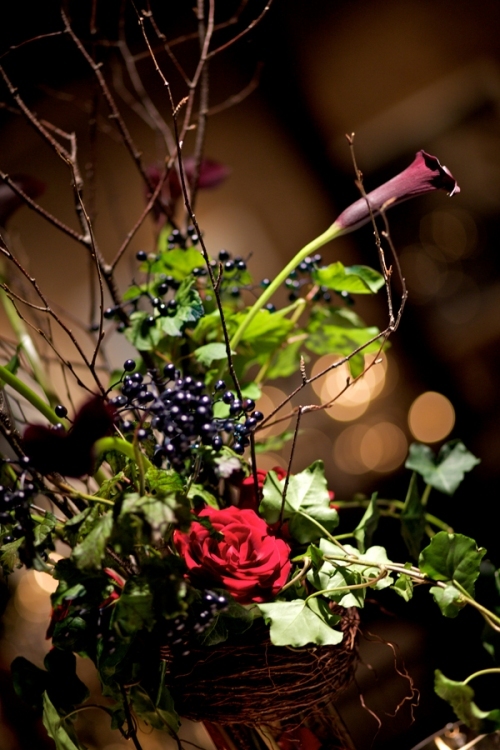 If you are special ordering a certain type of flower, ask about it's lifespan during the time of year at your location. For instance, if you are ordering a summer flower for a winter wedding (green house grown) - how will those flowers last for the duration of the wedding and reception? A knowledgeable and flexible florist should be able to help you slim down who needs flowers and help you combine a smart flower selection for your season. If the florist is leaving it up to you to make all the decisions with minimal input on helping you make the best decision, I would consider shopping around more. Lastly, remember that the style, location and formality of your wedding can also determine what is really necessary too, so have fun with it and be unique if you want to be, you aren't the only one doing so. Another resource for flowers may be your local farms. If you're looking for a bouquet that's organically grown or want something with herbs in it, you might find that your local farmers have selections just for you. You may also find that it's a good way to cut costs by bypassing the florist. Keep in mind that a florist may cost more for good reason. Florists can make the arrangements properly and deal with the technicals of the boutonnieres and corsages along with making sure your flowers don't wilt within the hour, so unless you know how to do this or the farm has a florist on staff, keep those points in mind. Your local florist may also carry or be able to order from your local farms as well. I found this article valid to share regarding cut flowers buyer beware. Consider your resource for your flowers be it a farm, stand or florist. The cheap deal at the roadside stand may not really be your best money option as your flowers may not last past the hour. 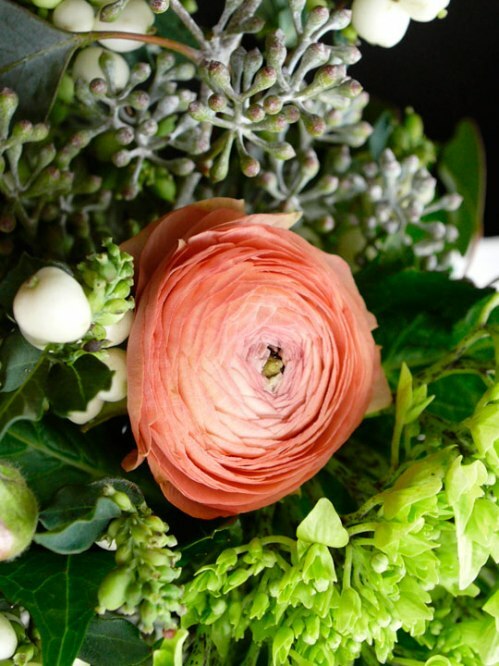 Here is a great resource list for the different varieties of foliage you can compliment your bouquets or arrangements with: www.flower-arrangment-advisor.com and they actually have a decent amount of advice on seasonal wedding flowers. If you're really into the symbolic meaning of flowers, REAL SIMPLE has a basic list here. 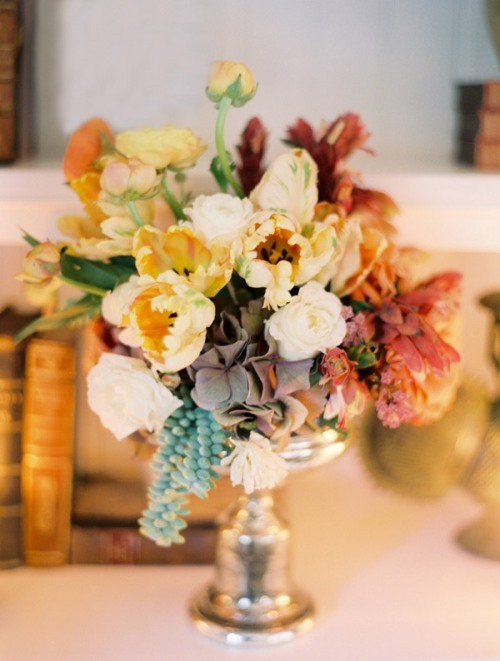 Gather a variety of flower types you want to use that correspond with the season of your wedding from research online or via magazines or wedding/gardening/flower books. Gather cutouts and snippets with notes (tape into a notebook and write in the margins) to show the florist. This includes anything from bouquet arrangements to just photos of the flowers (you picked in step 1) in the sizes and colours you are thinking. 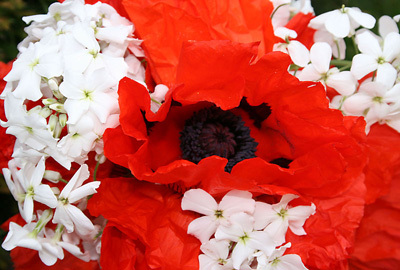 Keep in mind some varieties can also come in miniature sizes, which may be useful for boutonnieres and corsages. A good question for your florist - "Does this variety come in a smaller size to use on smaller pieces?" Who gets flowers? Ask about wedding packages. If you're on a tight budget, but you think you would like the entire wedding crew filled out with flowers, it might add up to be more expensive than you think. 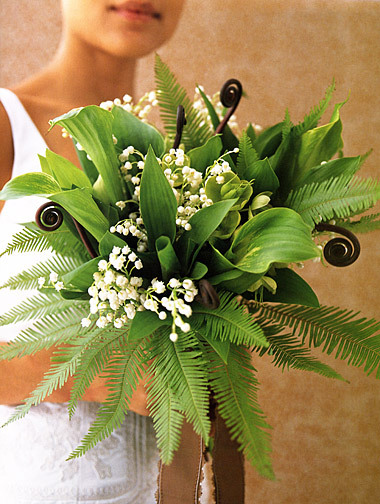 Possibly write a few variations you might suggest to the florist as cost-cutting options. Using Alternatives: Make sure Mom's and Grandma's won't be offended if they don't get a corsage. Remember, you may be O.K. with breaking tradition, but they may not. 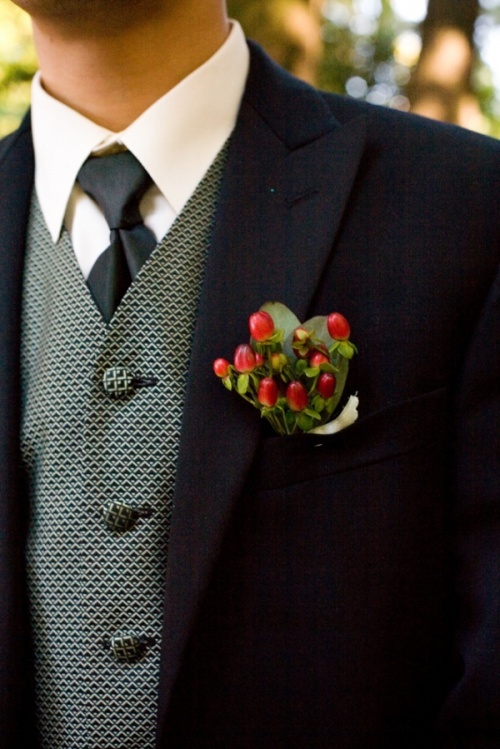 Think of an alternative to a corsage to make them special. For instance, if you're using Lilies, you could give them a stand alone flower with a ribbon-tag on it with a special handwritten note of how special they are to you (daughter to mom, son to mom and grandma's, etc.). Printout a Q & A page for each florist visit. Write or Type out your questions with spaces for notes. This will help you stay organized and review your notes later. Staple or envelope with florist name on it together, price sheets and any information the florists provides you with the Q&A page. Mix & Match Resources. You might consider using farms for flower arrangements at the reception and a florist for the wedding ceremony (separate locations). It could be cheaper. Do remember to ask about cut flowers life spans. You might also consider contacting local flower farms for flower petals or lavender supplies in bulk for flower girls to use on the isle. There are also many online resources for eco-friendly petals and flowers to toss. There are many resources for freeze dried petals/flowers as well as bio-degradable manufactured varieties. Here are some fun stamped out petals which are actually plantable by Daisy-Days.com. Very cute. Some locations may not appreciate having wildflowers pop up everywhere, but it's better than trash by far. *note: Not using eco-friendly flowers to toss, such as silk flowers or petals is really an awful option for the environment and a hassle in the days following. For example, a wedding in my neighborhood (we have a small amphitheater with large lawn and amenities for events) took place last summer and they used non-disposable silk petals. For weeks following the wedding, there were silk petals ALL OVER the neighborhood. In everyone's landscaping and yards. It looked like little white trash everywhere - impossible to clean up. Neighbors were pretty annoyed by it. Think of how many animals and birds may have digested them too. Just a note to consider. Here is a pretty decent and even more in-depth list on How to Pick a Florist by www.FrugalBride.com. Working with flower hues throughout the Year. 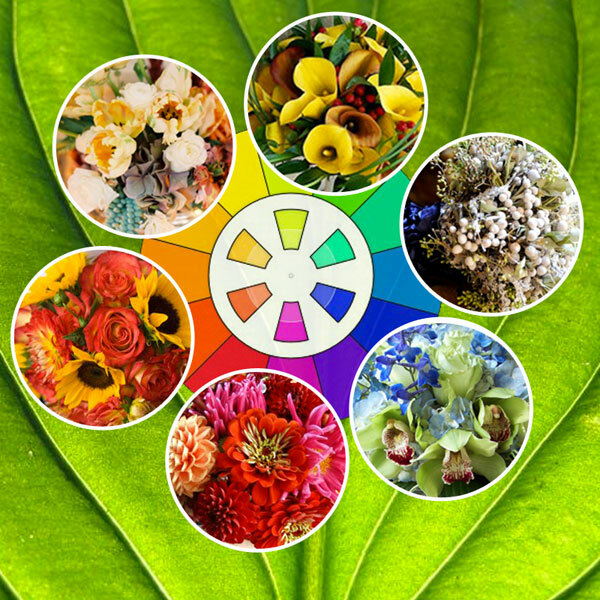 Let's take a look through the year and see what flowers will work for the different seasons. 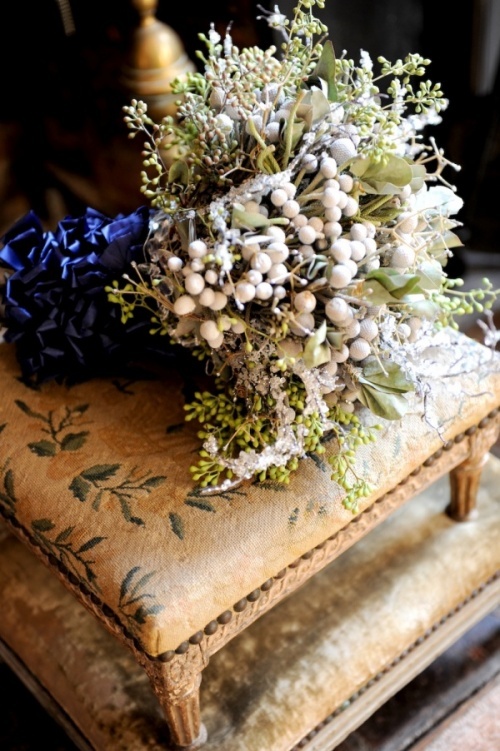 Keep in mind that some seasons are backwards for some people and some may be getting married in the tropics during the winter - in that case, make sure you contact the location's florists to gather seasonal flower picks. What I notice about picking flowers for a wedding is that the seasons tend to pair up for the most part. For example, Winter and Spring combinations go together and Summer and Fall go together. Then you get the in-betweens such as late fall, but not yet Christmas, pine cones and leafless trees, but no snow. Then there's late Spring, early Summer. Not exactly dealing with the heat of the day and possibly still worried if it will rain on that outdoor wedding. Let's start with Summer since everyone's itching for sun and the heat is just around the corner. Summer for flowers is considered mid-July through mid-October. Everything involves heat. Most people are working with a fiery flower palette. Here's a great list from Better Homes and Gardens magazine online for flowers that keep their cool in the midst of Summer heat and also some tips on preserving your bouquet. Combinations can include large Dahlia's & Zinna's which are a chunkier set of flowers so be mindful of bruising. Zinnia's are also available in smaller varieties and easy to come by so can be used in other pieces for boutonnieres or corsages. A funky little green flower you can use is a Green Kermit Mum which can used in boutonnieres alone and mixed also with the corsages as well as adding subtle greens in the main bouquet. Other late summer options include hefty sunflowers, Gladiolus, Hydrangeas, Iris's, Asters, Cosmos, Delphiniums, Lilies, Phlox and Poppies. 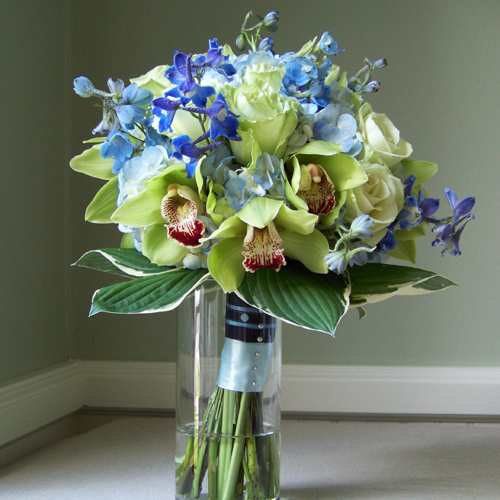 Early Summer picks can include a more formal bouquet made up of Delphinium, Hydrangea, Cymbidium Orchids, Roses and Hosta Foliage for a mix example. There are actually quite a few selections for winter flowers. But Winter can be tricky. Depending on the time of the season, you might want to coordinate. For example, if you are getting married in December you might go Christmasy (or not. Most people do) using Reds and Whites in strong contrasts. You don't have to use Santa Red, you can use any shade. January is less thematic for colours and February is red again with Valentines Day. In March, April and May you get more variety with Spring on the loose. Flowers for winter include: Amaryllis, Anemone, Calla Lily, Daffodil, Gerbera Daisy, Heather, Hyacinth, Ornithogalum, Ranunculus, Sweet Pea, Tulips or Viburnum. 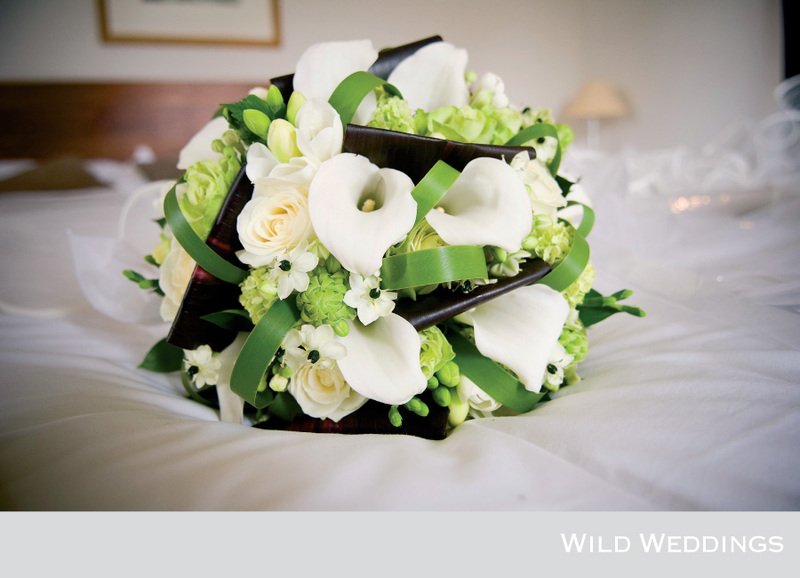 Flowers for any time of year include Orchids, Roses, Lisianthus and Stephanotis. Ranting. Here is a funny rant about finding your florist. I don't particularly agree with all her disagreements, but it's one brides perspective to another and maybe a warning as to what you're going to get yourself into. I say, keep your expectations open, people do have businesses to run and their time is as valuable as your time. iphone. Do you have an iPhone? I do and I live and breath iPhone. Here's a nice list of possibly helpful Wedding Related iPhone Apps. I haven't personally test driven any, but will check them out as soon as possible. Anyone using any currently? I've got a lot of other resources so if you have any questions in particular, please leave them in the comments and I'll do my best to respond. I hope you enjoyed the post, although very lengthy. link disclaimer: none of the out-links to vendor, magazines or web providers are for advertisement purposes. I simply liked the information they provided as good resources. I hope you find them useful. this post is excellent. keep them coming! Awesome. The flowers are just great!